Amazon Fire 4K TV box review | What Hi-Fi? The original Amazon Fire TV was only launched last year, but it has already been revamped. This latest version offers greater speed and power, as well as new storage options. The headline feature here, however, is the addition of 4K streaming. 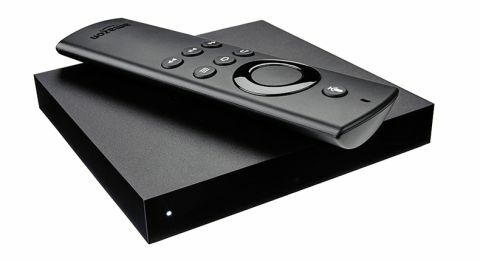 In case you’re not familiar with Fire TV, it’s a media streamer – a small set-top box that connects to the internet and streams media to your TV, projector or even through your AV receiver. We really liked the last Fire TV, but couldn’t give it the full five stars because it didn’t stand out from the similarly priced competition, such as the Roku 3. The new box might look almost identical with its matte top, glossy sides and sharp corners, but underneath it’s a very different beast. Did we mention it does 4K? The 2015 Amazon Fire TV the first streaming box to offer 4K, which is timely because there is now (finally) an increasing amount of content in Ultra High Definition. That content is split across the ubiquitous Netflix and Amazon’s own Prime Instant Video service, which is good for Fire TV because it is (at the time of writing) the only streamer brand in the UK to offer both services. To watch 4K on this Fire TV box, you’ll need a 4K television. And not just any 4K set – it needs to be compatible with HDCP 2.2. Then you’ll need a pretty good internet connection. Amazon reckons you’ll need a minimum of 15mbps. All good? Then you will be able to watch 2160p video at 30fps. There are some big TV shows on both Netflix and Amazon Prime Instant Video, though Amazon’s 4K films require separate rental or purchase. Only the TV shows are included in your monthly Prime subscription. Thankfully, those TV shows look really good. We jump from Amazon’s Bosch to Netflix’s Daredevil: both are gritty shows and that grit is remarkably sharp in 4K. We’re not talking about artificial definition brought on by processing, either – it’s a focused and insightful image that allows you to count wrinkles if you so wish. On the audio front, this box can pass through surround sound up to 7.1 via HDMI. Whether you get 7.1 (or even 5.1) depends on what the app and the content offers. The addition of 4K isn’t the only upgrade. There’s now more oomph under the hood: a Mediatek quad-core processor that processes at 2GHz, with 2GB of RAM. Amazon says that means 75 per cent more processing power than before, which is impressive because the Fire TV of old zipped along liked hurried thunder. We experienced no lag at all on the new Fire TV. It can easily handle a series of button presses without making you pause and wait as the cursor catches up. In fact, menus and content can open a little too quickly - sometimes it’s too snappy to be a smooth experience. It helps that the wi-fi has been upgraded. Now it is of the dual-band, dual-antenna, 802.11ac variety. Faster, with longer range. There is an ethernet alternative to wi-fi, which we recommend for a more stable connection. There’s also a bit of clever processing that Amazon calls ‘ASAP’, which learns from your viewing habits and pre-buffers what it thinks you’re likely to watch. The USB port also remains, though since we reviewed the last Fire TV, Amazon has released an update that makes it more functional. It can now be used to expand your device’s memory, handy for storing downloaded apps and games. Amazon does not officially play content from USB sticks, but it lets you download file management apps like Plex, which can read popular files types. Gone is the digital audio optical output, though a microSD card slot has been added, which can also be used to expand your storage space. The Fire TV has 8GB built in, but you can insert memory cards up to 128GB in capacity. That’s just as well, because there’s more of an emphasis on games than before. More power under the hood means the new Fire TV could in theory handle games that are closer to what you get on consoles, rather than simple point-and-click apps like Angry Birds. There’s even a new dedicated controller (sold separately for £40), which makes it easy to play complicated games, like Goat Simulator, for example. The Fire TV interface hasn’t changed much. You get a bunch of categories on the left side of the screen. There’s a focus on Amazon, which occupies the prime real estate and tucks others away under ‘apps’. The app selection is expanding all the time, with the latest being ITV Player. This first-party focus still applies to the voice search function, which refuses to acknowledge third party apps. No, we don’t want to pay for Better Call Saul on Amazon – we can get it free on Netflix. A universal search would be better. In the meantime, voice operation has been improved. Now it has no problems understanding trickier names. We ask for the actor Chiwetel Ejiofor (our standard test for anything voice-activated) and the Fire TV correctly brings up Serenity and 12 Years a Slave. US models of the Fire TV benefit from the ‘Alexa’ voice assistant, which can answer queries about the weather, sports and traffic info. We look forward to seeing this in the UK. The first Amazon Fire TV was good, but it failed to stand out from the crowd. The Fire TV of 2015 is a different proposition, however. The same money gets you a faster, smarter, and altogether more capable box. And did we mention it does 4K?